Sometimes it is as easy as pie. And cake and candy. Inspired by treats of the sugary (and delicious) variety, our Sweet Stuff collection features playful designs in vibrant colors with a pop of gold foil for extra charm. Foil Stamped Cake Note: Frosted goodness with plenty of layers takes center stage on this note. 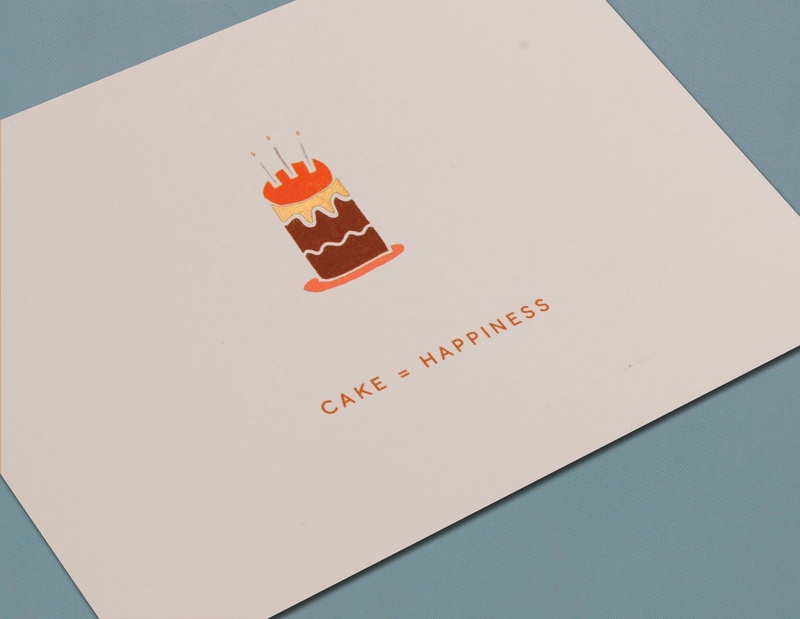 Chocolate cake accompanied by the most delightful of equations — “Cake = Happiness” — makes it the perfect choice for a birthday party thank you or a much-needed pick-me-up to a close friend. Foil Stamped Cupcake Note: What’s better than cake? A cake all to yourself. 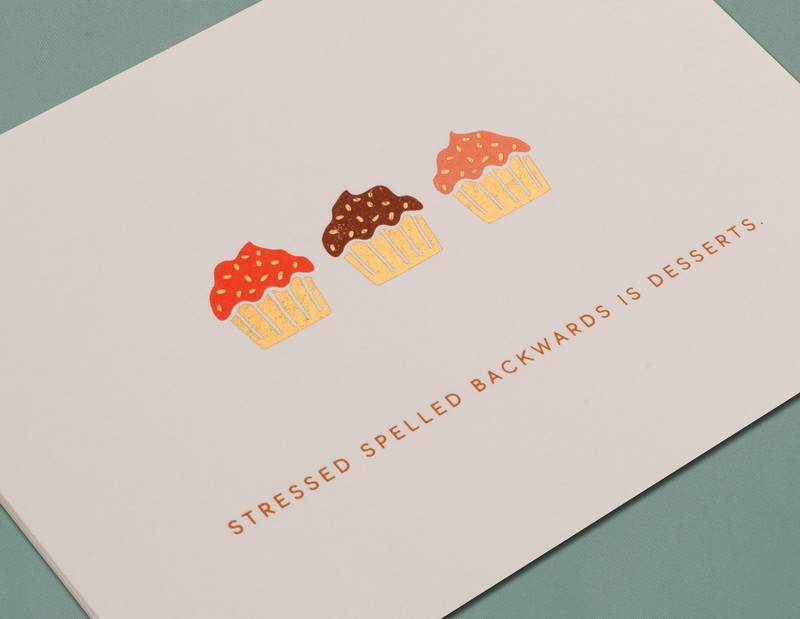 Lined in a row of three and accompanied by a deliciously insightful fact — “Stressed spelled backwards is desserts” — the cupcake makes this note the perfect choice for a note to a friend in need of a thoughtful word or thank you after a sugar and fun-filled evening. Foil Stamped Hard Candy Note: One’s coffee table should never be without the beloved candy dish — filled to the rim, of course. 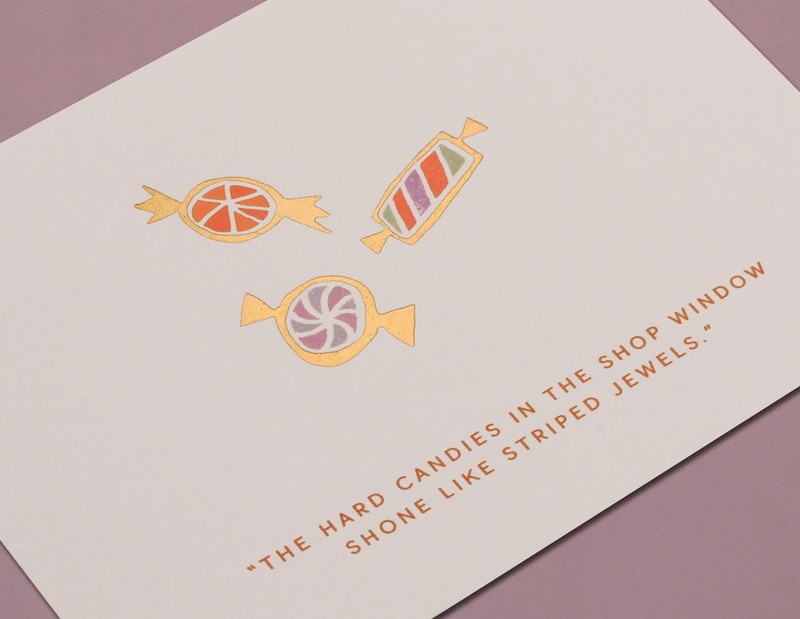 Scattered about in kaleidoscopic delight and accompanied by the perfect candy store quote — these sweet pieces make this the perfect note to send to old friends and new weeknight cocktail-sipping partners alike. Foil Stamped Ice Cream Note: We all scream for the cold, chocolaty swirls that take center stage on this note. 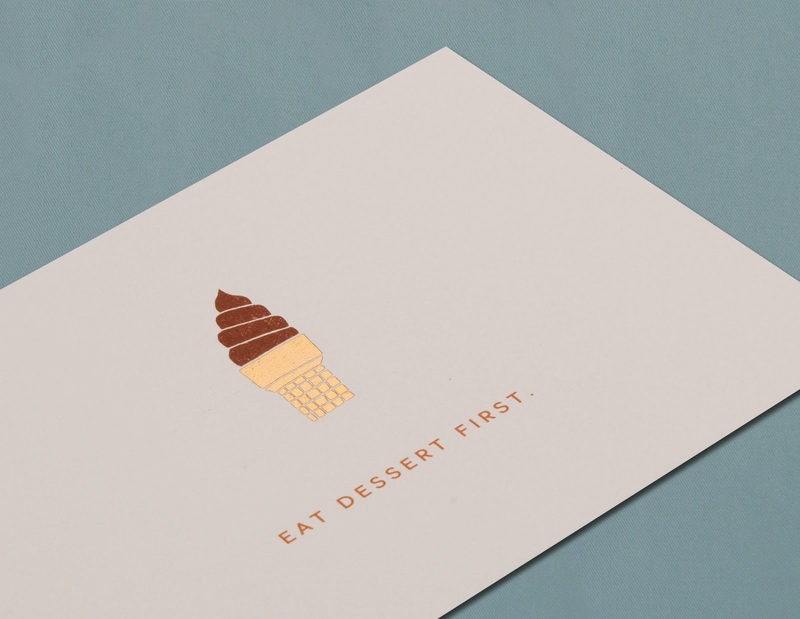 Perfectly presented atop a sugar cone and accompanied by a very merry mantra — “Eat Dessert First” — it’s the perfect choice for an invitation to the ice cream social and quick hello to your fellow frozen treat lover alike. Foil Stamped Lollipop Note: Swirled sweetness takes center stage on this note. 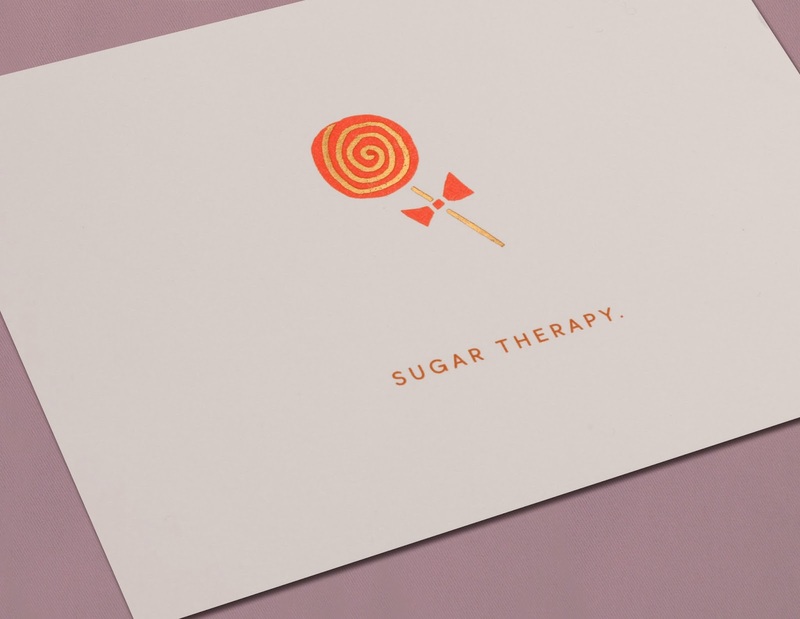 A striped lollipop accompanied by words that speak the delightful truth — “Sweet Therapy” — makes it the perfect stationery for a spa day invitation and hello to a best friend alike. Foil Stamped Pie Note: Sweet filling and buttery crust is a winning combination, any way you slice it. 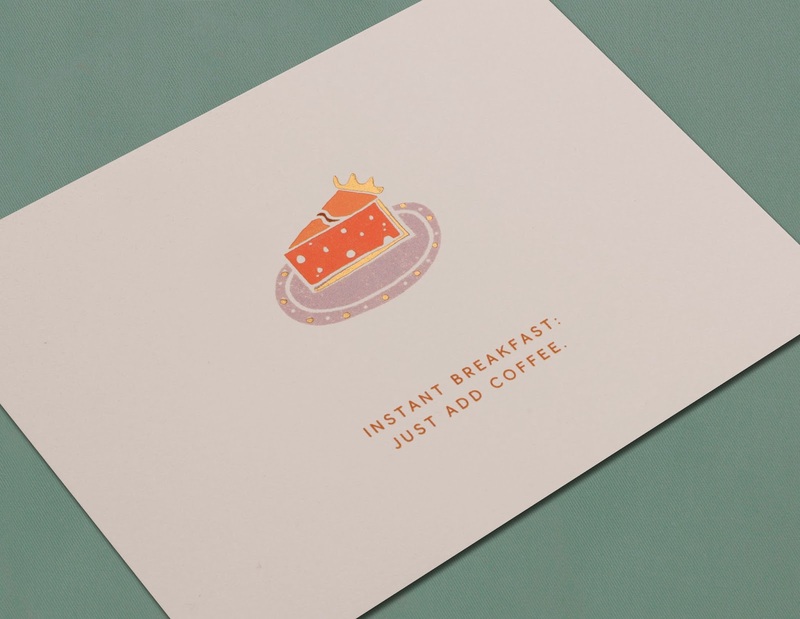 On this note, one of our favorite pastries is presented with a delicious suggestion — “Instant breakfast: Just add coffee” — making it the perfect choice for thoughtful thank yous to favorite friends and an invitation for early-morning treats alike. View our entire boxed stationery collection.